You are here: Home > Stay Hydrated with DIY (Do-It-Yourself) Fruit Flavored Water! The summer weather is heating up and it is important to stay hydrated especially when you are spending more time outdoors and being active. Instead of reaching for sports or energy drinks that are high in sugar and calories, try drinking more water. Water is a great healthy option that is calorie and sugar free. Keep cool and hydrated with these yummy fruit flavored water recipes. They are easy and fun to make with the whole family. Take ordinary water and make it something special that everyone will enjoy! 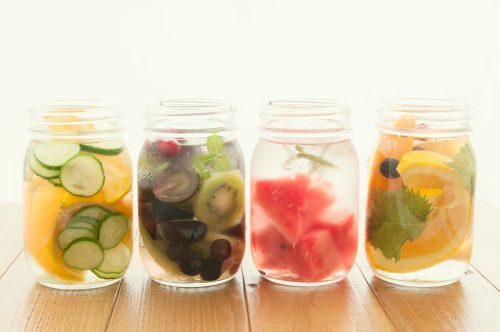 Try one of these refreshing fruit flavored water combinations or be creative and make your own! Wash all the fruit or vegetables. Cut the fruit or vegetables into small pieces. Measure all the ingredients. Add the ingredients into a 2-quart pitcher and add cold water to fill the pitcher. Chill overnight in the refrigerator to get the most flavor. Store in the refrigerator until you are ready to drink. The fruit will stay fresh in the water for up to 48 hours. Enjoy the flavored water and eat the fruit!